Want to give your beat-up, worn-in jeans a subtle lift? Or don't have the time to get them hemmed properly with a chain-stitch? Just cut them off at the ankle. Let us state for the record, this is not a look for everyone. From Sid Mashburn's inspiration board.Nor is it an option for every pair of pants that are a tad too long, but there's something about it that looks fresh. It's something we noticed floating around street style snaps lately and we know Sid Mashburn's a fan of the fray. We've seen him sporting self-snipped Levi's and he posted this shot to his new online inspiration board and it did just that—inspired us to try it out. The key to this look is a trim pair of jeans and we've found a single cuff adds some nice dimension to the fringe. It looks right whether you're sporting boots or loafers and best of all, it's an update that will cost you absolutely nothing. After cutting your new hem, gather the edges together and rub to loosen the threads. 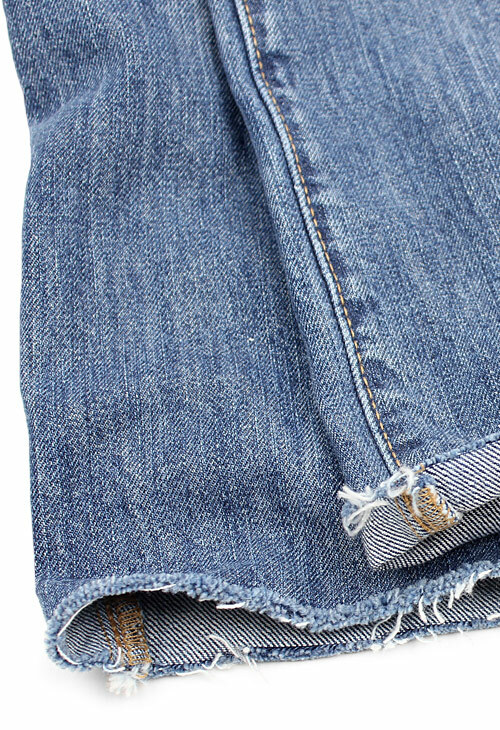 Toss the jeans in the dryer for a soft, frayed edge.